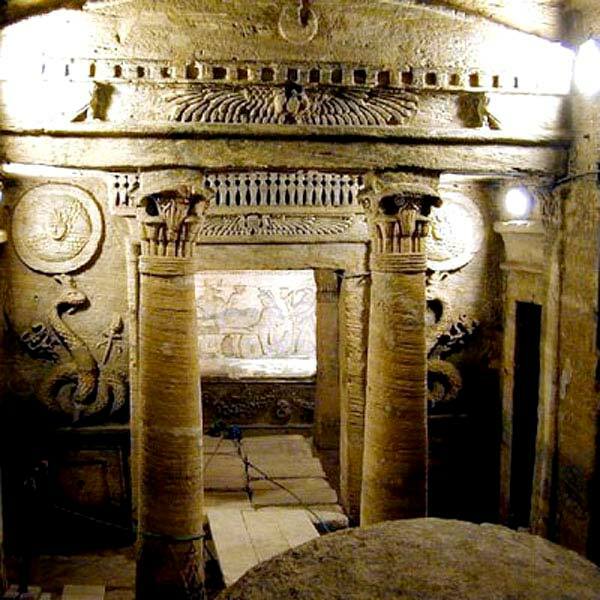 The Catacombs of Kom el Shoqafa are some of the most stunning monuments in Alexandria. These underground tunnels are one of the wonders of the world and among the best preserved ruins in Egypt. The catacombs are located east of the city and date back to the 1st Century AD. The underground tunnels were used as cemeteries until the 4th Century AD. Although there is a popular belief that a donkey fell into the catacombs in the year 1900, resulting in the discovery, the truth is a little more conventional. Excavations started in 1892 until Mr. Es-Sayed Aly Gibarah, an Alexandrian, discovered the catacombs by opening a vault while quarrying a stone. As expected, the catacombs were originally used for tombs. Historians believe that the site may have only been used by one wealthy family originally. This family is believed to have practiced an ancient pagan religion. However, the catacombs soon grew and became a mass burial site. The Catacombs of Kom El Shoqafa are one of the last major structures related to the ancient Egyptian pagan religion. Additonally, the direct influence of many other cultures present here is remarkable. The Catacombs got their name due to the similar design to Christian Catacombs in Rome. There are three levels in the tomb. There are several types of architecture here, including Egyptian, Greek and Roman. The levels are carved into the rock along with a staircase and a rotunda. There is also an antechamber, a burial chamber and a vestibule. Inside the burial chamber there are three sarcophaguses. The Catacombs are well preserved and remain in a similar state as they did many centuries ago, but the lowest level of the tomb is still submerged in subsoil water. There is a spiral staircase with 99 steps that goes into a shaft. This shaft was used to lower the dead with ropes to prevent bodies from being damaged. After the staircase, there is a vestibule. This space was used for visitors to rest after going down the stairs. The rotunda is a circular hall that leads to the second story of the tomb. This is surrounded with a wall enclosure that has a dome on top. This dome is supported by pillars. The shaft is the focus of the first level. There were five stone hands that were found at the bottom of the rotunda that have been put on display at a museum. The “U” shaped triclinium, or banquet hall, has three benches in it and is also supported by pillars. The remains of a mosaic floor can be seen and the ceilings were ornamented as shells. This space was used by guests to dine and rest in.